DALLAS, June 13, 2018 /PRNewswire/ -- This week, o9 Solutions will be attending the 11th annual S&OP conference hosted by the Institute of Business Forecasting and Planning, IBF and the Association of Supply Chain, APICS. The Best of the Best Conference is a global gathering of top industry minds. The first day of the event will include numerous panel discussions and educational sessions by top speakers including, Sara Park from Coca-Cola and Five Guys Supply Chain Manager, Rizwan Asim. The goal of this event is to educate and network with like-minded supply chain professionals. However, o9 Solutions has a different goal; to discuss how o9 can improve the S&OP process using artificial intelligence (AI) for each organization attending the conference. Visit the o9 Solutions booth to view successful case studies and set up a meeting for further information on o9's AI-powered platform. 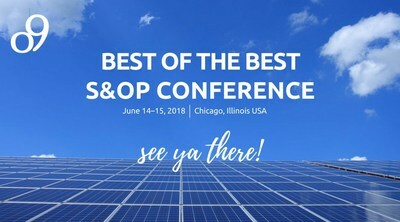 The Best of the Best S&OP Conference will be held on June 14-15 in Chicago, Illinois at the Chicago Marriott O'Hare. For more information on the event call 777-693-4444 or go to www.o9solutions.com for more information about o9 Solutions. The Institute of Business Forecasting & Planning – IBF is a membership organization recognized worldwide as the premier full-service provider of demand planning, forecasting, business analytics, S&OP (Sales & Operations Planning)/ IBP (Integrated Business Planning) education, benchmarking research, corporate training, e-Learning, professional certification, world-class conferences, and advisory services. Since 1981, the IBF has been helping businesses improve their forecasting and planning performance in an effort to enhance growth, optimize supply chains, and improve their bottom line. It has been said that no other organization on the globe has as much depth in its educational content for S&OP, Demand Planning & Forecasting as IBF. The IBF is known for two levels of certification: Certified Professional Forecaster (CPF®) and Advanced Certified Professional Forecaster (ACPF®).